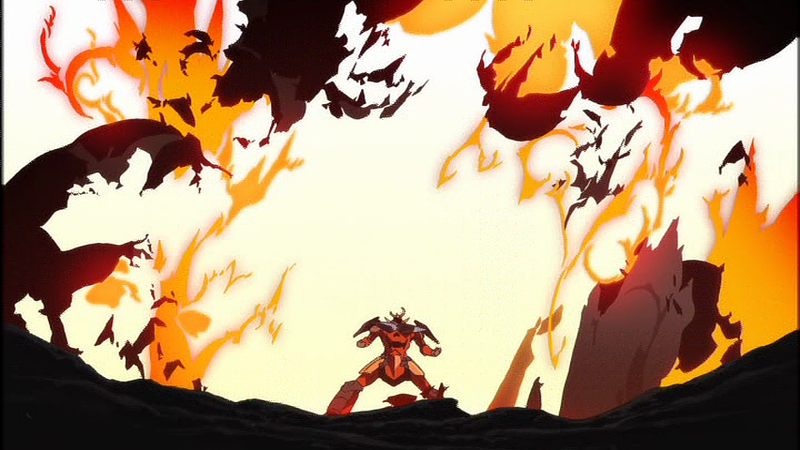 Gurren Lagann may be one of the most completely thought out anime series ever made. An impressive feat considering the idea of the series, according to interviews, revolves around a drill. 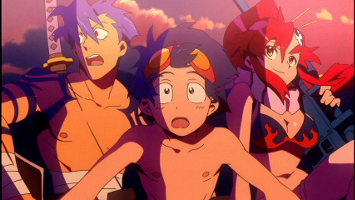 But if there was a team that could pull it off it would be Gainax; the team that brought us Evangelion. Not only did they pull it off but they exceeded expectations. Gurren Lagann takes place in a dystopian future where humans are forced to live underground by the mighty Spiral King, Lordgenome. It centers around a timid boy, Simon the digger, and his arrogant, decisive brother, Kamina. One day while digging Simon unearths a mysterious spiral artifact. A sequence of events that changes his life follows shortly after. His village is sieged by a giant mech, known as a Gunmen. A scantily clad female by the name of Yoko arrives shortly after hot on the heels of the huge machine. The Gunmen are piloted by creatures known as beastmen, sent down by the sinister Lordgenome. Simon discovers a Gunmen of his own and uses it to battle the beastman. Thus begins the long journey of Gurren Lagann. The show has a number of elements that make it stand out. It is semi-reminiscent of The Power Rangers at first. 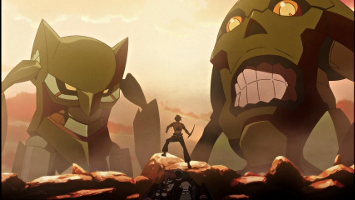 A villain who sends down monsters to the surface of the earth for some robots to fight. 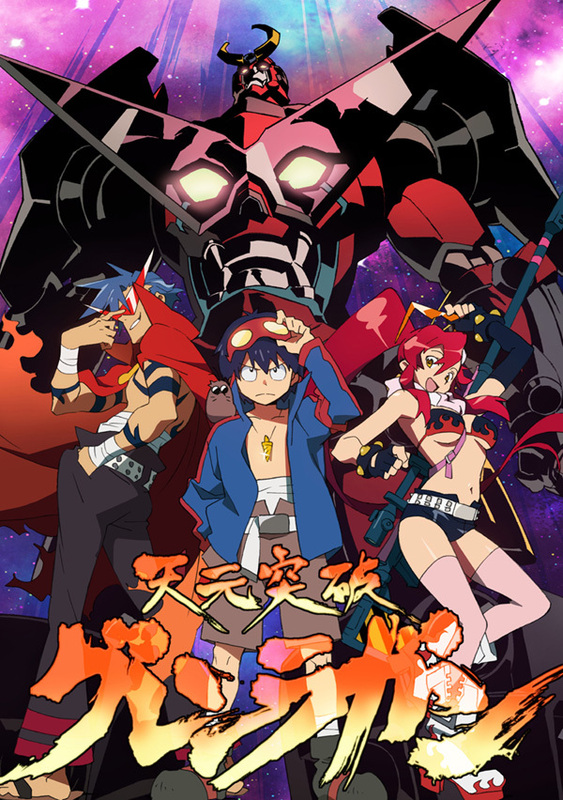 The Gunmen, specifically Gurren and Lagann (Simon and Kamina’s Gunmen) combine to form Gurren Lagann. They retain this form most of the time but detach occasionally to do special moves and such. However, Gurren Lagann, much like the show, is always evolving. As the show progresses more allies are added. 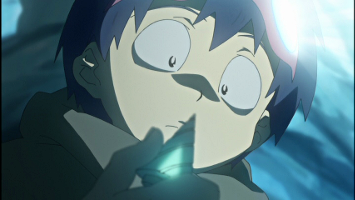 Rarely do you see a show without wasted characters, every character on the show is important and Gainax takes some gutsy measures with some major characters. The animation is just as brilliant as the story. The Gunmen look great and they even show emotion (sort of). The characters all have personality. Yoko, though simplistic in design, it’s hard to believe that a redheaded bombshell wearing a bikini top, boy shorts, and thigh high stockings hasn’t been done before. It hasn’t but it works. The show uses a variety of animation styles throughout some gives it a grittier look other times to elicit laughter. 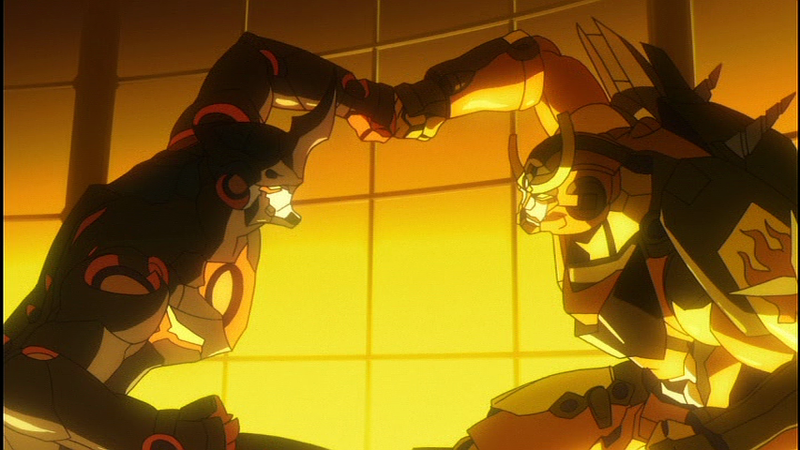 Gurren Lagann is transcendent not only in terms of scope but with character evolution and development as well. The action is titillating and the show is sure to stir up a variety of emotions. The consistency of delivering top notch episodes from beginning to end is impressive. Fans of the genre should have already seen this show but for those who haven’t will be in for a great time.